Lawmakers on Wednesday grilled a top Trump administration official about her oversight of a controversial project to create a new headquarters for the FBI, who in turn declined to answer key questions due to the privileged nature of presidential conversations. 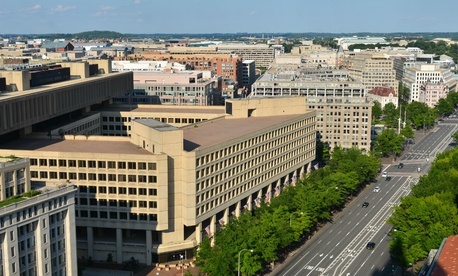 The congressional hearing followed government reports questioning President Trump’s involvement in the decision to cancel the planned relocation of the FBI headquarters to the Washington, D.C., suburbs in favor of demolishing the current building in downtown Washington and rebuilding on the same site. General Services Administration Administrator Emily Murphy also came under fire for her role in the project and her previous testimony to Congress in which she failed to disclose a White House meeting she had on the headquarters issue. Rep. Mike Quigley, D-Ill., who chairs the panel of the House Appropriations Committee that held the hearing, wasted no time in highlighting Murphy’s past. In several instances, however, Murphy declined to provide that clarity. Asked whether anyone in the White House communicated their own preferences regarding the location of the FBI headquarters, the administrator said she wanted to be “very careful” about her response and told the committee she would “respectfully decline to answer.” When pressed, Murphy noted that she was not formally exerting any specific executive privilege, but relying on precedent that agency heads not disclose conversations with the president. Murphy was later asked whether she was specifically aware of Trump’s preference on the location of the FBI headquarters. “I’m going to decline to discuss conversations that I may or may not have had with the president or his advisers,” Murphy responded. She added she was authorized by White House counsel to discuss final decisions made as a result of her meetings with Trump and his staff, but not the deliberative discussions that took place during them. The headquarters location issue sparked a firestorm after the Trump administration decided to end a 10-year procurement process to relocated the FBI's central office in suburban Maryland or Virginia. Congress had already signed off on the move. Democratic lawmakers and government watchdog groups have accused Trump of putting his thumb on the scale during the decision-making so the government would not sell off the current FBI space to a developer who could then build a competitor hotel down the street from his current Trump International Hotel. The current FBI building is 50 years old and is in such poor physical shape that certain parts of the office are roped off for safety reasons. Murphy said that last month, an eight-pound concrete block fell from a ceiling and landed on an employee’s workspace. It damaged property, she said, and narrowly missed injuring or killing the employee. When current FBI Director Christopher Wray took over, he canceled the procurement for a new location and told GSA he wanted to instead raze the current headquarters and build a new facility at the same location. Murphy said that decision was made by the FBI, not GSA, and occurred before her 2018 meeting in the Oval Office. Murphy said she brought some concerns to the FBI after Wray made his decision to cancel the suburban campus procurement, “but on matters of national security we’re going to defer to the FBI director.” She also explained that GSA took issue with the inspector general’s assessment that the relocation to a suburban campus would be far safer and cheaper than the “raze and rebuild” option. Murphy argued that GSA would not simply be able to use the funds it collected from the sale of its current space to buy new property. Quigley responded that ultimately, it was all taxpayer dollars. The new building would hold fewer employees than the suburban campus option, with the FBI planning to relocate 2,300 employees to field offices around the country rather than consolidating 11,000 workers in one location. Republican lawmakers took a gentler tone with Murphy, saying they respected the work she has done and that they did not want to impugn her motives. Graves later suggested that members of the Maryland and Virginia congressional delegations, such as House Majority Leader Steny Hoyer, D-Md., had influenced the initial decision during the Obama administration to move the headquarters out of Washington.